We discovered the utterly glorious Pride of Britain Hotels collection while working on our England magazine - spending rather decadent nights at The Montagu Arms in the New Forest, and Buckinghamshire’s Hartwell House, a picturesque historic home-turned-hotel now managed by the National Trust. Made up of over 50 hotels that stretch across the British Isles, each Pride of Britain offering brims with character, showcases the region it’s found within, is often accompanied by a peculiar and fascinating history, and is sure to make you feel that your getaway, no matter how fleeting, is truly restorative. So when we were given the chance to dine with and rest our heads at the decadent and design-centric Dunstane House in Edinburgh, we jumped at the chance! The newly refurbished, family-run hotel has been owned by Shirley and Derek Mowat for over 20 years and has grown dramatically in that time. The duo had originally travelled down from Orkney, bound for London, where they had dreams of running their own hotel. But upon discovering this Scottish bolthole, they found they no longer had a desire to part with it - or Edinburgh. Located in the calmer, lesser-explored West End, the hotel’s heritage has been lovingly maintained - indeed, they’ve clearly revelled in the joys of having a stone Victorian Townhouse as their canvas. The interiors are a mix of the traditional and playful, and Dunstane House is filled with homely Orcadian accents. It is the definitional of boutique and worthy of its five-star rating. The walls are adorned with artworks that depict calming Edinburgh and Orkney scenes, while the colour palette is inspired by the Orkney landscape, the soft blues and beiges bringing to mind the wildest of northern beaches. In the downstairs bar, attached to a light-filled dining room - the setting of relaxed breakfasts and dinners that feature the most delectable Scottish fare; hearty, inventive and absolutely perfect on those cooler winter nights - Orkney gins and whiskeys are served, alongside creations from local microbreweries. The bar itself - the Ba'Bar - is named for Okney’s answer to rugby; a game played twice a year (on Christmas and New Year’s Day, which also happen to be the local hospital’s busiest days). There are no rules and it is equal parts madness and brilliance, with the entire community getting involved, hoping to get the ball to the town wall or water to claim victory. A Ba’ ball, given to the player of the match, takes pride of place above the blue, art-filled bar. As it should! The hotel’s most recent refurbishment saw Shirley and Derek return it to its neoclassical roots in their decor and furniture choices. 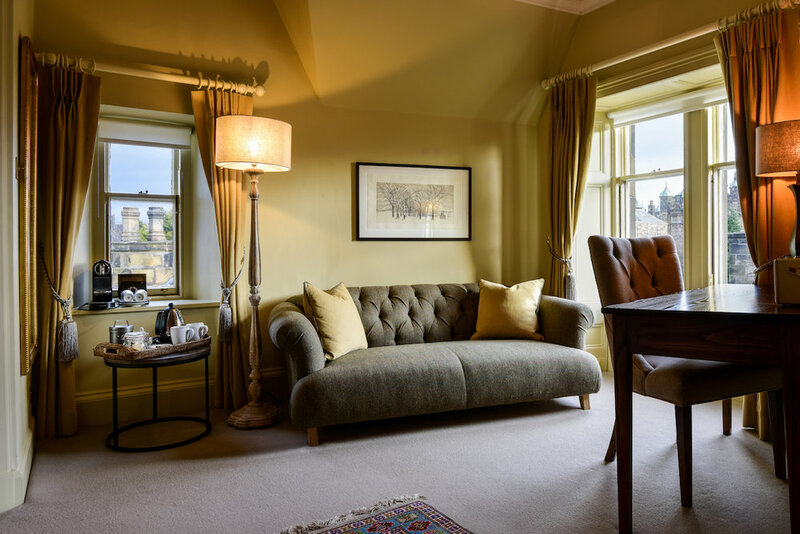 Original cornicing becomes a statement feature, chairs and throws are adorned with Orkney tweed, and each room - all of which are different - comes with shortbread, made fresh every day. 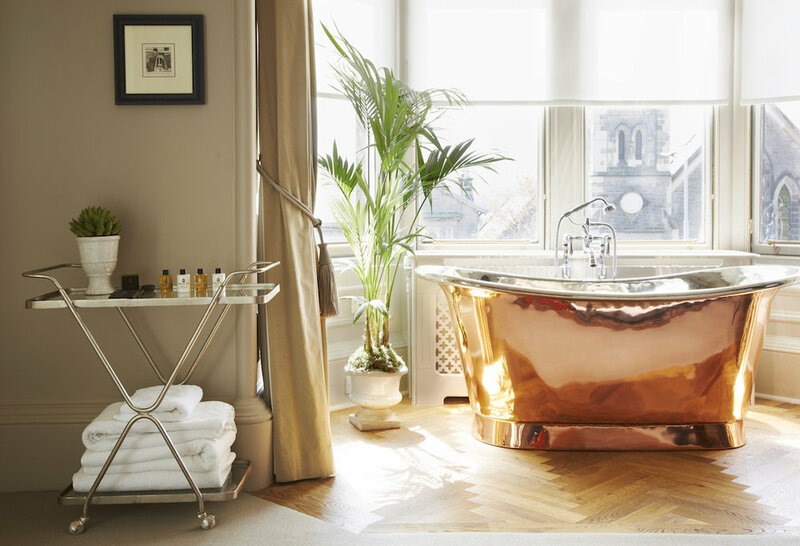 There are four posted beds in some, the odd freestanding copper roll-top bath, restored vintage wardrobes, Persian rugs, thriving house plants and flowers, an assortment of sculptural lighting features and wallpapers you long to secret away. Many of the furnishings are either bespoke or sourced from antique fairs - all different, all curious, and that’s precisely the point. Everything here is intentional, considered, a work of art. This is a hotel that captures the soul of Orkney in a quieter corner of Edinburgh - a place I can’t wait to return to. To learn more or simply book a room, click here.